(Photo: Ecumenical News / Peter Kenny)Busan tourism staff promote their city at the World Council of Churches 10th Assembly in the South Korean city on November 1, 2013. BUSAN, South Korea - Busan is South Korea's second biggest city and the world's fifth largest port for sea tonnage. But it also boasts the country's longest beach, a pristine peace of sand that throngs with people in summer. 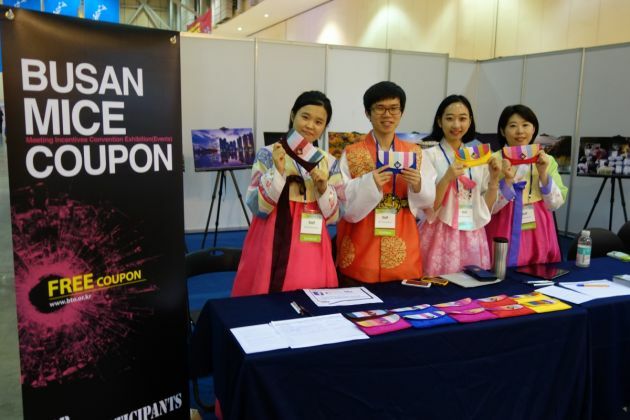 Young Koreans have said the 10th Assembly of the World Council of Churches in Busan will boost tourism and development in the place where they were born and love proud that it is Korea's fastest developing area. Some of them told Ecumenical News current Assembly for the World Council of Churches, which represents around 560 million Christians will also strengthen their faith. Some 5,000 people gathered in the city's massive Bexco conference center for the opening day. Students said the meeting is also drawing attention to the important, but often neglected, role Christians play in South Korea. "It will boost the faith of millions of people here," explained Kim Jin Mi whose colleague Jung Eun-hye agreed with her. The three are studying education at the Presbyterian University and all hope to become teachers in years to come. "Busan is a very beautiful city," said Seol. "This conference will do so much to give us the publicity we need and that will encourage more and more tourists to visit our city's resorts and attractions. "People have come from all over the world and that is good for our city's development, the tourist industry and, of course, our hotels and restaurants." So Jin Park is one of the publicity managers at Busan's Tourist Organization and she said that although it's hard to quantify how much money a conference such as the WCC meeting will generate it would boost the city's image as a prime tourist destination. More than 130 foreign journalists are in Busan for the conference and well over 200 Korean videographers, camera operators, reporters and features writers are covering the event - one of the biggest Christian events of the decade. "It's bound to have a big spin off for the tourist industry," said So Jin. "We hope that all visitors take some time off from the job of making the WCC conference a big success and visit some of our most beautiful resorts." She added: "And we hope they tell their friends and one day return as tourists." Jeon Seoyoung of the Busan Tourism's MICE convention bureau said, "We are using the MICE bureau to promote our city at this Assembly and we are very pleased with the interest shown in our city." WCC joggers have been seen each morning on the beach, but few have ventured into the cooling water the separates Korea from Japan.